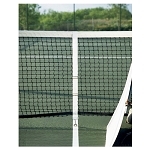 Edwards Pickleball/Paddle tennis net is 22'L x 30"H and is composed of 3 mm knotted polyethylene. Heavy duty vinyl coated headband and vinyl tape on sides and bottom. Vinyl coated top cable. Does not included side dowels and comes with one grommet top and bottom and bottom, on sides. Stretch out the net across the court. See if you winder post mechanism has a hook or a hole to accept the cable. A. If it has a hook, use the cable as provided by attaching the loop to the hook. B. If is has a hole, (internal mechanism) cut off the loop at one end of the cable. Leave some excess in order to allow for several turns around the internal mechanism. Now, insert the plain cable into the hole. Attach the loop on the other end of the cable to the hook half way down the outside of the "dummy" post. Crank up cable/net to 34" at the center point. DO NOT OVER-WIND! Insert dowels (provided) through the end side tapes. Attach the headband to the net post with the rope provided. Square up the net and lace it to the post using the black lacing cord provided. 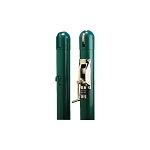 Most post have lacing bars for easy installation. Use the side grommets on the net to accept the lacing cords. 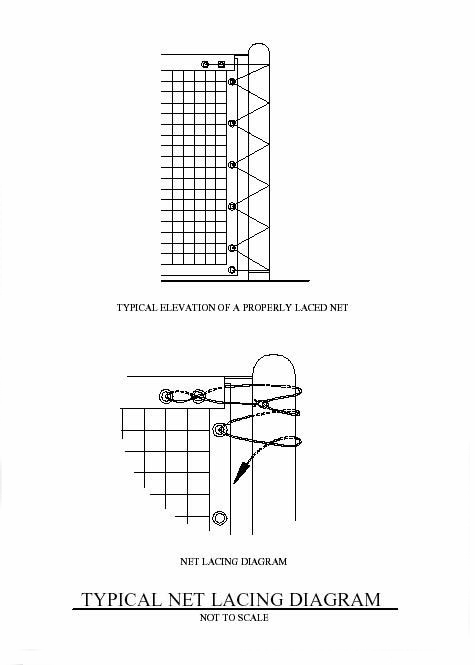 If the posts do not have lacing bars, hooks may be provided or you can lace around the net post. Measure the depth of the net in the center and adjust the center net strap (if used) making the net 34" at the center-line of the court. 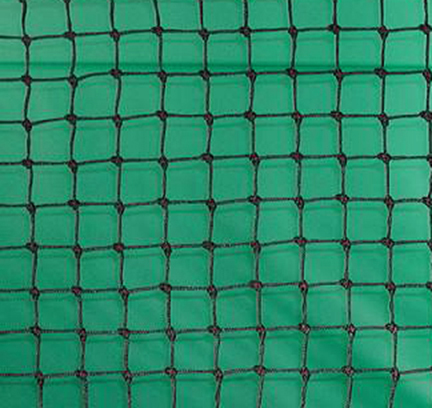 Your installation is now complete and your net should sit comfortably but somewhat tightly between the two posts with a very small gap between the net and nets posts.